Hello! This is my literate wolf pack. Please read everything mentioned in the table of contents so you can properly judge if you want to join or not. A full list of materials typed out below in the order that they appear. Introducing the pack history, the territory, and the story line. The rules and guidelines for this role-play. This includes rules, posting guideline, pack guideline, pack law, and more. Information on the wolves, the pack, the ranks, and the character skeleton is the posted at the bottom of this. A post reserved in case something gets flagged. This pack was founded by three siblings from the south. They wanted to go north, farther and farther north, until the sun would only warm them and no longer burn them. When they finally found that place, they settled down. For a long while, the youngest, a fae, lead the pack. She was noble and proud, but when another fae joined and became her brother's mate, she stepped down. The back had to have fresh blood to continue. Pups were essential. This is why she let her brother lead. Her sister wasn't happy about this, since she thought that it was pointless to just step down. Because of this disagreement, they fought for a long time. Born twins, they were equally matched in strength. Growing up together, they were equally matched in mercy for each other. The yin and yang in them was so strong, that the moon and son spirits felt that this war between them would never end. Since they both took pity on the sisters, caught in a petty battle, they descended to earth in the form of brute wolves, trying to distract them. However, the passion of the fight between the sisters came from love and worry. Nothing could distract them. Angry at being ignored, the sun lashed out violently, but the moon guarded the two she-wolves, granting them the powers of the moon and her dearest, the ocean. Yin and yang of the truest sort, push and pull. Endless life and the appearance of opposites, the twin sisters were left as guardians of the pack. They could never appear before those that knew their name, but they could guide those lost. It was a blessing and a curse, but the two took strength in each other. The feud ended in affection, and their friendship and kinship became endless. Their brother searched for them, but life went on and he never saw them again. His pups grew and had pups and soon the pack became more populous. After many years, the sister's names were forgotten, but their spirits and the knowledge of them stayed strong. The terrain changes drastically between summer and winter. Three of the four seasons are met with snow, but summer and late fall the land is rich and warm. There are two places that stay the same basically year round. The more important of those two is the den site. It is tucked up between two of the mountains, a small vale where there are only a few trees growing. Here, the ground is covered with various dens. Each den is shaped different depending on it's purpose. There are four main types of den and there are a multitude of each type. Most of the dens around the clearing are Common Dens. They have wide mouths, slooped roofs, and are cozy, but easy to make. Then there are the pup dens. These have small mouths and go straight up and then straight down only to level out. They are very snug and apt at keeping pups inside. Then there is the Healer den. There is only one of those and it is nestled under the roots of a tree. It is large enough for five grown wolves to stay there and there is a small pool in the back. This is where the healer lives and tends wounded. Next, there is the alpha's den. There are two of these on opposite sides of the clearing. They are rock structures with cracks in the front and a warm, medium sized space that fits two adults and pups with ease. They are there two alpha dens? Because fights happen. The other place to rarely get snow on it is the hot springs. This lays just to the east of the den site and is part of the reason the den site is always warm. There are several deep springs that usually stay a nice warm 100° year round. One of the most important spots in the territory is, in fact, the hunting grounds. Here, Elk gather to graze and on the edges, rabbits feed off of the grass. Lemmings gather to get the seeds, and ground birds nest here. It is a rich hunting ground in summer and spring, but even the hunting ground isn't spared in winter as the herds move on. However, it is still the best place to try for a meal. Then there is the river. Here, swimming and hunting is fun in summer and the warm days of spring and fall. However, during winter, this is where a lot of wolves drown on the day of darkness. The water is so cold that there is no hope of climbing out of it. It freezes you through in moments. During late spring and early summer, flowers bloom here and it is a nice place to relax with pups. The lake is fed by both the hot spring and the river, so most of the year, it is warm enough to swim in, but cool enough that it doesn't make anyone uncomfortable. The feeble feed it receieves from the hot spring, however, isn't enough to stop it from turning to ice in winter. The terrain is open for additions if the pack finds a new hide-out or hang out in the area. The pack is called Hollow Cry, because on nights when clouds cover the moon, you can hear the sound of two wolves howling. Their voices are strong but seem to have no root, as they echo through the territory. Those that wish the pack well find comfort in the sound. Those that don't feel a cold chill of terror. It is said that neglectful mothers will lose their pups if they stray from their side turning the full moon and for the next season, the pup will cry with the two proud voices. The young brute known as Strava appeared out of the darkness one night. Only half grown, he was but a yearling. 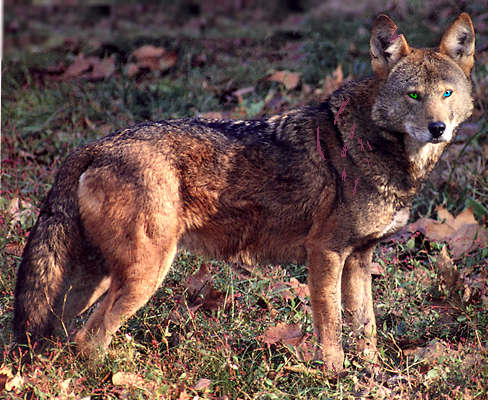 His eyes flashed like fire as he prowled into the camp, his hackles up and his teeth bared. None wanted to approach this young wolf. His fear scent was strong, but so was his determination. He only stayed in the camp for a bit and then disappeared. Each night, he returned and prowled around. They watched him grow and changed from one night to the next. One day, the pack was hunting when Strava appeared again. This was the first time seeing him in sunlight. He lead the hunt without permission and it was then that the knew for certain that one day, he would be the alpha. Mala Ptica was wounded as a pup, stustaining a blow to the head that left him partially blind and deaf. Because of that, the pack feared that he would have no future. The art of healing wasn't practiced at that time. Yet, Mala survived and managed to reach adulthood. He wasn't very useful to the pack and he knew this, but he also knew that he had to find a way to be. One day, his brother, Ogromna Orla, was wounded horribly in a fight. Mala went through the forest and began to pick herbs. Voices whispered in his ears, guiding him and telling him what to use. Ogromna Orla would have died if not for the Spirits of the Packs before aiding his brother. You must follow the FooPets rules as well as standard RolePlay rules. Failure to follow this will result in posts being ignored. Follow the posting guidelines, appearance guidelines, and other information given on this post. The only reason your wolf should not fit the requirements is if you messaged me about it and we worked out some sort of agreement. ** Logical fights: a fae described as small can't beat a brute described as large. No spamming and no bumping. There is a posting order typed out below. Follow it. ** The only reason you should is if I give you permission by posting on your wall for you to go ahead and post. ** Skipping someone's turn is not allowed without my permission or theirs and I must recieve notice that they gave you permission. The Rules are open for change. If you want to avoid trouble, check back. Each post must be a paragraph long, per character. This a bare minimum of four sentence per character. Longer post are encouraged. There is no limit to how long your posts can or should be. Move the plot ahead with each post. Do not type a whole paragraph moving it forward, especially if there is a conversation goig on, but remember to take gradual steps forward so that time doesn't stand still. When posting as more than once character, be certain that each change in point of view is obvious. This is recommended by marking it with the name underlined or in brackets. You may do it however you like, so long as it is clear. Spelling and grammar should be checked. Small mistakes are passable, but if you think that there are many errors, copy and past your text to a program that has word checker. There are several differt ones online. Writer's block is understandable, but do not use this as an excuse every time. ** Check HERE for proper height and weight of your wolf subspecies. ** Your character must be the right height and weight. If it is a mix of two subspecies, it can not be the maxiumum height or weight for the larger of the two. ** If you want your wolf to be taller/heavier than average, post a message on my wall so that we can discuss it. ** Each species has its own fur length, but unless it was noted on the link, you may describe your wolf however you want to. Short spiky fur or long, thick fur or anything in between. ** The normall colors for a wolf are brown, tan, white, silver, gray, black, and russet. These colors will be accepted, but I am encouraging members to go with odd colors, such as blue, green, or red. ** The normal patterns for wolves are eye dots, chest, belly, muzzle, neck, tail top, tail bottom, tail tip, shoulders, hips, back, etc. You may also go with symbols and other designs as long as you describe them in detail. Remember to list colors next to patterns. Head: This is just so that you can tell what colors are where on your wolf's head and also tell if s/he has big ears, round ears, a sharp nose, thin muzzle, rounder cheeks, etc. ** Abnormal, but accepted: Any color you can can think of. 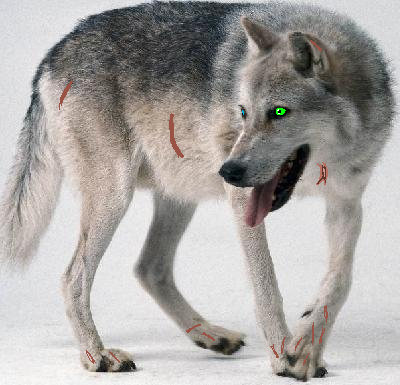 Build: This is so you can tell if ther is anything different about your wolf's body shape. Long legs, broad chest, etc. Scars: Pretty obvious, you can also go with designs and patterns that are abnormal for scars. Looks are pretty well open, but no wings, horns, or other abnormal growths. Alpha’s word is law, first and foremost. If their order conflicts with the law, use your judgment to see which is best for the pack. The alpha is to be respected and honored. Defend your alpha, for they are the bases of your pack. Loyalty to your pack is demanded. Betraying them is death of the soul. Young are the future. You are to protect them reguardless of whose pack they are from or what species they are. Friendship and new comers are encouraged, but never should a tresspasser be welcomed. Treat new faces with caution and do not forget what is best for your pack. The betas are second to the alphas. Resepct them, for they are your kin. Prey is to be shared with the pack. Let others know when you have made a kill. Return to the den with a meal for the pups and elders. Ears forward + Bite muzzle + Growling = I am your Alpha! Stiff Legged + Ears pulled back upward + Tall + Tail high = Do you dare disrespect me? Ears forward + Bares teeth + Tail straight out = Respect your Alpha! Snaps air + Bite side + Head below shoulders = Get out of here! Stands over submissive wolf + Snarling + Tail high = I’ll put you in your place, do you want to be an omega? Pushing on shoulders with paws + Growling + Snapping = Submit now! Bares teeth + Glares at = Im not in the mood right now, Leave me alone! Ears pulled back + Whining + Tail low = Im sorry! Please forgive me! Ears flat against head + Roll on back exposing neck/belly + Tail tucked = I give up! You are my alpha or Im sorry! Lowers head + Snarls = I’m warning you! / Last chance! Snarls / Bares teeth = Get away! Snarls + Bristles + Bares teeth = Back off! Lunges = I will attack! Ears back + Tail tucked + growling low = Scared or get away! Snaps at air = This is your neck/leg! Play bow + Yipping = Lets play! Tackle/Glomp = Dogpile! or Playfight! Tackle + nip anywhere on body = Lets playfight! Play bow + bounds away = Cant catch me! Nip on nose = I win! Roll on back = I give up! ♥ Licks ear = Will you be my mate? High Pitched Howl: Telling pack to attack! Nose to Nose: You are the one. To Forehead: I respect and love you. To Cheek: You are such a cutie. To Stomach: It’s okay, it’s just a kick to mate, it also means hey guys! to the pups. This is the order in which you will be posting. After joining, check back here to see if your user name has been added. If it has, please post after the person above you on the list. Since I am at the top of the list, it should be fairly easy to keep people from being skipped. When you are signing off, please tell us if you want us to pause the scene or if you're okay with us continuing. You have twenty minutes to post when it is your turn. If you fail to do so, I shall send you a message on your walls. If I don't get a reply in ten minutes or you haven't posted, I shall tell the rest to skip you. Hopefully, this will allow us to keep the plot moving even when others go to sleep. Mala and Orla are brothers. Zivota is Mala and Orla's half-sister. Ren and Daren are brothers. If you can't be bothered to delete the things that are in parathensis, I won't accept you. 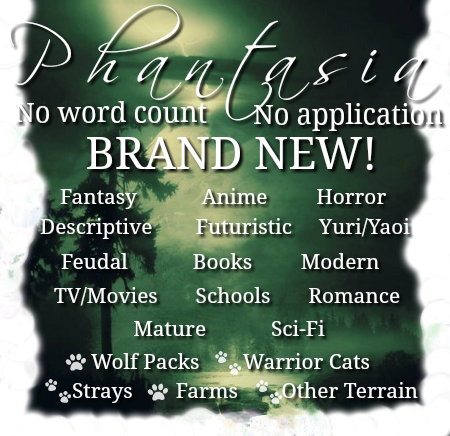 Please, feel free to post it under Characters or PM me with it to keep the forum from getting clogged. Bone tired, dejected, and feeling lost, the solid gray brute stumbled after the familiar smell of his nephew. Where Craven was leading him and his twin, he had no idea. Some part of him screamed in protest of blindly following, but he was so tired that he honestly didn't care if it was a trap. Heck, maybe he deserved to die after everything. Daren watched Craven as the young brute padded eagerly ahead of them. It was concerning to see how happy he was. Normally, Craven cowered and growled...or just growled. Now, he was padding ahead eagerly. Glancing back at his twin, Daren had to remind himself that he hadn't seen Craven in moons. If the young brute hadn't gotten them from Eletra, there was no telling where they would be by now. Shaking his head, he told himself to trust a little more. It was as confusing to him as it was to the others. Why was he happy? The humming that built in his throat and threatened to break free was the complete opposite from anything he had felt before. It was hard to completely ignore the reason why, but for now, he was content to regard it with a blind eye. Glancing back at his two uncles, he pondered something a bit stranger. Why had he gone after them? His mother was gone. She had run off a long time ago with that damned dog. There was no chance of ever seeing her again. He could have severed all tied and moved on with his life. When his eyes turned towards the front, he saw a dark silhouette and was reminded that he couldn't. No matter what he did, the past forever haunted him. Strava could see from his perch in the mountains just beyond the densite: strangers were approaching. One was familiar. It was the brute, Craven, a fighter that had joined them not so long ago. Tilting his head back, Strava howled in mourning of the sister that Craven had lost and the healer that the pack had lost. He would forever mourn the young Lost. She had been a brave soul and already the pack had given her full rights. It still didn't seem like enough, but nothing ever would be. Mala couldn't help but bear his teeth in agitation as he snapped his jaws at a fly. Damnit. Damnit. Damnit. He hated it. Hated hated hated it. Shaking his head, the wolf muttered irritably to himself. Stomping his paws on the compact ground of his den, the brute howled angrily before storming out of his head. Pacing around the clearing a few times, he was quick to slink back into his den. He didn't know what he was doing, but damnit, he didn't care either! Incessantly, voices slipped past his ear fur into his mind. Zivota caught a familiar scent and just as she was about to question herself, she heard Strava's howl. Her tail wagging a million miles an hour, she burst from the clearing and ran through the territory. She couldn't believe it! She was so happy! "CRAVEN!" Zivota howled loudly as soon as she spotted him. She almost wavered when she didn't see the pup with him, but reminded herself that Craven hadn't promised anything. Shaking her head, she sped up and crashed into him. Whining desperately, she pleaded jokingly, "Don't ever leave me again!" The small fae carried on. Her body was weak, and she was rolling in misery again. This time she wasn't as skinny, she was just worried. All her family had been wiped out, she didn't even know what had happened to half of them. She didn't know where she was, or why she was here, she had just been aimlessly walking around. Her mind had been lingering in the past, but today she had stopped. She had decided to let go, and just find somewhere to be on her own. As her golden eyes focused on her feet, she slightly stumbled, before stopping, to slowly collapse into a tight position, resting her head onto her paws and watching the sky. She could tell presence was ahead, so she had stopped. Not sure if her scent could be smelt or not, she honestly decided not to care; feeling too worthless. She felt so alone, and of course, it could only be Bella. Name Meaning/Origin: Beauty, for the cause of her form. Build: She has a dainty build. Her legs and slim, with small paws, and her body is quite slim, but nomal build to it, just not bulky. OffSpring/Pups: Dew, Ohanzee, Vatra, Jynx, Annabelle, Isabella, Cian, Chance. Crushes: Confused about Connor/Has been missing Ren but gave up a while back. Friends: Flight, Lightning, most others have passed. History: Bella was born to a large pack. The attention was all focused on her as the Alpha's daughter. She was pretty, had a great personality, and was loved. She didn' seek attention like others, and loved her life. When the large pack was attacked by rivalry though, her parents had died or so she thought, so Bella fled for her life, with a small other one from the pack, named Fang. The two became best friends surviving on their own together as puppies. Shortly becoming teens, the two moved on, to find empty territory they claimed as their own, to call Golden Star. There Bella met White-Fang, but he accused her of cheating and she soon left him since she didn't cheat. After a while, she met Ren. The two fell in love and became mates. They had three pups, and were happy together. After not seeing him for a while, she gave up and started saying she didn't have a mate. He came back, and the routine went on. A few times between when Ren was gone, Bella met Travis. He was madly in love with her, but Bella didn't return the feeling, she still loved Ren. When Ren didn't return, Bella became mates with Travis, and had four pups. The two eventually got into an argument, and split up, only for Bella to find Ren again and fall back in love. They didn't become mates again though. Ren got tired of hurting Bella, and found someone else: Mystique. It tore Bella up, which started her different personality. After months of torture, seeing the two in love. Mystique and Ren got into an argument after though, which made Ren come back to Bella, only to become mates now, realizing their love. Though Bella figured out from Daren that Ren still loved Mystique. She couldn't take anymore, and left. Months passed, being alone, and she found Connor. He helped her through most of it, and did what he could. He fell in love with her, and she fell in love with him. The two became mates and had pups. Now Bella realizes it was for the comfort, she never wanted Connor. He went on a rage from their son trying to tear them apart, and tried to kill him. It caused Bella to not trust anymore, after thinking she could trust everyone, she learned better. While alone at Lithe, it got attacked by the rivalry pack again. Her family was split up, and she gave up, coming here, but not knowing Ren was here. OCDs/Odd LittleHabits: She has a habit of her left ear pinning backward when irritated or confused. She also doesn't talk about love easily. Wants in a mate: Simply someone she can trust. Everytime she's ever trust, it's been broken, so all she wants is someone who really cares for her. Pet Peeves: Females who act better than her, Liars. Playful-Serious: Mostly serious, but can be playful when called for. Outgoing-Shy: Mainly shy, but out-going around the ones she knows. Bella is quite the bi-polar wolf. One minute she will be sweet, but could go angry with anything you say. Her eyes are usually focused on something else, and she doesn't like confessing feelings. Her trust issues are large, and she doesn't like others to be sarcastic to her. When around who she loves, she is kinda and wonderful, totally herself. But for the moment, she's breaking down. Mala caught a familiar scent, one that nearly stole his breath. The brute froze at the peek of the hill that he had been wondering around for days. Turning, his eyes searched with a longing gaze and came upon the figure that they had been missing. His tail swayed once, but then he tore himself away. Taking off at a fast run, he raced blindly forward, hoping only for escape. For countless minutes, he raced blindly ahead, but then, without warning, he stopped. His sides heaved from the exertion and the stout, heavy set brute growled in annoyance. Shaking his head repeatedly, he reminded himself of the impossibility. The growl died abruptly as he caught a scent that held no familiarity to him. Hunches tensed. Teeth bared. The brute glared at the source of the scent that didn't belong there. "Fae," he barked darkly as he caught sight of a white fae. Her pelt was so odd, so different. He had no idea what to make of it, but he hardly minded. His head was too tangled up in his heart to pause at the sight of something new. Once he knew that she had heard him, he took a step forward, his body language clearly displaying his distrust. Regardless of her state, his pack's safety came first. He had been their only fighter for a long time, and he was far from eager to give up the attitude that came with it. There was a soft snarl in his tone as he demanded, "What brings you here? Name Meaning/Origin: Soaring Eagle is what his father named him, after seeing an eagle soar over head, just minutes before they were born. Much like his brother, Orla has medium length fur that is very easily managed and seems to just fall into place. His fur, however, is a molted mix of brown and gray. On his face are various hues of brown, around his next is a ring of tan/peach, and is body is made up of different shades of brown/gray. The insides of his ears are the same peach/tan as his neck. His ears are a brown/gray on the outside. Orla’s eyes are average size and almond shaped. Around his pupils is dark brown, almost black, and around that is a golden color. Orla is large for his subspecies, but average size for a brute. His legs are average length, but his forelegs are more muscular than his hidelegs from swimming. Not freakishly so. Orla has many small scars all over his body. None are very noticeable and only a few have stories. Offspring/Pups: None Orla would very much like to be a father. He loves pups and didn’t mind pupsitting when he was a teenager. Current Mate: N/A He is constantly on the lookout for a good fae to become his life partner. Crushes: No answer Right now, his heart is tangled and confused. He is telling himself that what he feels isn’t true. It would be easy to sway him from his current infatuation. Friends: Many Orla doesn’t bother to name names. He has friends. Enemies: Few He has enemies, but why gratify them with being noteworthy? Orla was born to the beta wolves. His mother and father were fixated on his brother most of his pup hood, and Orla grew into the habit of looking after him. When war struck their pack, Orla was trying to protect Mala when he was wounded. Assuming he was dead, he watched in horror as his brother just walked away. When he woke up, Mala’s tired form beside of him, Orla realized that his brother had found his purpose and was proud of him. However, Orla felt lost for a long time, since his brother no longer needed him. Now, he searches for someone who will. He closes his eyes when he is extremely happy. Wants in a mate: dark fur, black or a dark hue of purple, green or silver eyes, a sweet fae that is easily upset and needs someone to protect her, but is very strong in her own way and loves pups. Not the smartest bulb in the box, Orla would rather be hunting then trying to think through problems. He doesn’t back down on his opinion and will often resort to violence to get his point across. He doesn’t have a short temper, but when his temper is gone, it is best to simply avoid him. XD Launch right into his heart problems. Ren, you are so cruel. T.T Is Spare still mine? (Don't worry, I won't bring her in. Catching a familiar scent, Craven caught sight of Zivota shortly before she tackled him. His heart ached from the howl of mourning that escaped Strava. Nuzzling the fae, he whined happily as he greeted her wordlessly. Hearing her demand, he started laughing and told her, "Maybe I will. Maybe I won't." Smirking, he told her with his eyes that nothing would stop him if he wanted to go. Nothing could keep him there if he longed to roam. Glancing back at Ren and Daren, he introduced them with a simple, "They are both apt hunters." Watching Craven with the fae, neither said anything, but there was an amused glance shared between them. Both shook their heads and sank down about the same time. Daren tucked his head over Ren's neck, as Ren leaned against his chest. The two were closer than they had ever been and that suited them perfectly. [color=mediumseagreen]Zivota rolled her eyes at Craven's reply before looking past him at the twins. Her body tensed slightly and then she started to grin. Dipping her low, she murmured a soft, "Welcome," before turning away from them. Catching Orla's scent, she tensed only to relax as he turned quickly away. She didn't want to fight with him today. She caught the scent of another fae and started to shake, only to still herself. Now was not the time to be spaztic. Now, she had to take the two strangers to meet her alpha. To Craven, she told him, "We have to show them to Strava." To the two brutes, she assured them, "Strava is nice as long as you are polite." [[Muzi! Mala is mine. "/ Orla, like Orca, because he is the fighter. DUH! Bella immediately tensed for an attack since she had been used to it for the past few months, and her pelt bristled as she stood, her head snapping in his direction. She actually hadn't seen this was territory, before she heard what he said. Ugh. "Um, my body. You know, the ability to move?" She snapped, before dipping her head in a respectful way. After all the sarcasm faded, she softly added, "I am Bella. I'm seeking new shelter. My family has" She paused, thinking of the right words. "Well, moved on. My pack was destroyed, and I want somewhere new." She said, giving a soft smile. So bi-polat, but sweet in a way. Wren, a small, quick bird, named for his mother's fixation on birds. Ren, a shortened version of his original name, meant to distance himself from the deceased pack. Ranks In Those Packs: None of importance. | Alpha Male at one point, primarily a hunter. His bottom layer of fur is a very dark red, but the top layer is a more mild red with touches of cream/lighter colors on his face and legs and black on his neck, back, shoulders, hips, and feathers. On his tail, the black and red are thoroughly mixed to make a more smokey red. The only white on his pelt is on the tip of his muzzle and insides of his ears. His fur is usually fairly well kept, despite the fact that he rarely wastes his time grooming. His fur is solid gray with almost white graident on his body that darkens to a charcoal gray along his spine. His fur is long and constantly looks shaggy, no matter how well groomed he is. A bit more round than average, his eyes are blue and green, mismatch. His right eye is green and his left eye is blue. A bit more round than average, his eyes are blue and green, mismatch. His left eye is green and his right eye is blue. His head is average size, though his muzzle is slightly longer than average. He has a coal black nose, large, fluffy, pointed ears, and a beautiful face. Large and muscular, he is at the peak size for his subspecies, which is proud of. His legs are long and his body slightly shorter than average. Every bit of him is muscle. His head is average size, though his muzzle is slightly longer than average. He has a coal black nose, large, fluffy, pointed ears, and a beautiful face. Large and muscular, he is at the peak size for his subspecies, which is proud of. His legs are long and his body slightly shorter than average. Every bit of his is muscle. Long and full, his tail is a mix of white and black and gray, thoroughly mixed. He has a multitude of scars on his paws from the fire, a few on his shoulders, neck, and back from fights, and one on his ear from a fight. He has a large scar on his chest from his fight with Vatra, there is a medium sized scar on his side from a fight with a bear, his paws are scarred pretty badly from the fire, and he has other small scars from fights. Storm, It didn't last long, and it didn't burn bright. It simply didn't feel right. I lied to tell you I loved you because I needed you to believe I did. I am sorry. My heart was captive to another. If I could take it back, I would. Sedna, Forever doesn't begin to discuss it. I loved the way you loved everything. I hope that someday we can meet again when my heart is truly free. For now, it still doesn't beat with me. You are amazing. Bella, Once upon a time, it was perfect. We just couldn't work with it. I disappeared. You moved on. I came back. Things got hard. It repeated. We repeated the same paths. Never more, mon amour. My heart belongs now to the dove. Mystique, You saved me, and now you probably hate me. I loved you and maybe still do, but I can never tell you the truth. I'm self destructive and you need someone better to love. Chenia, You were vain, but who can blame ya? We were insane, but who can blame us? Things were hotter than fire, and we burned even brighter. Wondering where you are. Hope that you're taking care of my heart. Bella, Going on three years of unrequited love. I have no hope of ever getting in that part of your heart, so why can't I get you out of mine? I could be happy right now if it weren't for you. I hope you know that. Chenia, Run as far as you want, we'll come together again. I know that something so perfect could never end. Until then, here is to hoping that you don't burn yourself. Many that will hardly remember us. We love them and give them our trust. Until we meet again, we pray they never meet an end. Don't live so long without making a few, but none worthy of note. History: Respective histories can be found posted under characters. An extremely dark or extremely pale fae with fair eyes and a friendly personality. He wants a friend more than a lover. Doesn't. Ren would rather not take a mate again. He would love a few faes that he can flirt with and romance, regardless of looks, that won't fall for him. Self assured, calm, reserved, Daren betrays little of himself. If you did not grow up with him, it is unlikely that you could ever guess what he is thinking. A passionate heart controlled by a stubborn mind, if he acted upon his impulses, he would be a lot happier half of the time. He is truly Ren's other half. Confident, excitable, extroverted, Ren loves to let the world know how he feels. Friends and enemies alike have little trouble judging the wolf, but he has no problem with that. He loves what he loves, but his heart is fickle and changes often, and his mind is too flighty to focus on just one for long. If he paused to think, he would be happier half of the time. He is truly Daren's other half and takes great pride in his brother. The twins nodded, not sure if they should be relieved by the oddly colored fae's words or not. Daren knew that he could manage to handle what ever sort of leader they came by, but he wasn't so sure about Ren. Ren, on the other hand, felt that whatever the alpha did wouldn't bother him, but Daren was likely to fly off. For the sake of each other, they were worried. Grinning slightly, the brute glanced at his uncles and told them, "Go with Zivota. She will show you to Strava. I want to find a friend of mine." Pausing to make certain that it was okay with all parties, he took off at a dead run. It took him only a minute to cross the familiar territory. His heart raced silently in his chest as he eagerly approached the only brute that he had ever viewed with such mirth. Grinning as he came upon Orla, he ducked low and crept up, hiding himself as best he could. Once he was near enough, he launched at the male, tackling him. Snarling and snapping, he went straight for the thick throat, hoping to deal a death blow, only to stop and fall back. He was nearly frozen as he looked at Bella. His long, blood colored pelt bristled. If his mother had seen him just then, she would have died from fear, but the look in those green eyes wasn't aggression or malice. It was soft concern and affection. Pouncing away from the brute, he asked the fae, "Are you truly here? Are you truly Bella?" He didn't think about the scents that had to be clinging to his fur. He didn't think about the past that he had with her. He only remembered the happiness Ren had when he spoke of her and the agony Daren hid as he remembered her. Tail swaying, heart breaking for his uncles, he hoped for the answer, even though he wasn't sure what he hoped for. ...Ren and I are skipping this. Strava is talking with the other two. Mala is still in his den. Narrowing his eyes, the brute warned her, "I have little patience for smart alecks." He wasn't aggressive, at least not unnecessarily so for facing an intruder. He didn't relax as her sarcasm faded, but his glare lessened slightly. Tilting his head, he was about to reply when a weight hit him in the side as a familiar smell reached his nose. Freezing, he was completely still before twisting snarling. Just before he could strike back, Craven began speaking to the white fae. Baring his teeth, he demanded softly, "Craven, who is this?" Bella was shocked at the attack, but then backed up one step, staring. Her gaze hardened as she added harshly, "Yes." She braced for an either attack or injury. Craven seemed in a way familiar, but she couldn't remember much. Her mind raced, along with her heart. Wagging Craven laughed at her tensing and sank onto his haunches. Affectionately pawing Orla, he assured the brute, "She is cool. Her name is Bella. My family is friends with her...sort of." Looking at her, he teased her jokingly, "I bet you don't know who I am when I am not growling, plotting, and miserable. Two guesses and I'll tell you." Abruptly, his focus went back to Orla as if he had just thought of something. Quickly, he assured him, "Not my friend, so don't worry. She isn't from any of my packs." The tone in his voice was urgent as if he had to make certain that Orla understood that. His green eyes were weary as he waited for a reaction from the brown brute. Bella was suddenly confused. Was this familiar territory that she hadn't remembered? Closing her eyes, she shook her head. "No, I don't remember you." She said, sitting down also. Although her small body was still slightly tensed, she seemed a bit calmer now. "Please tell me?" She asked quietly, her tone genuine. She seemed honestly confused, and a little bit put out. Still watching Orla wearily from the corner of his eye, he looked back at Bell and chuckled. "Not surprising. We met only a few times. I am Sparrow's son," he told her. It was hard to believe for anyone that had met him before. He no longer hunched over with a snarl twisting his muzzle. The giant of a brute stood his full height, almost a head taller than any other. He was proud of his size and it showed in the soft, minty eyes. The way he tilted his head made him look like a pup, rather than an aggressive warrior. Smiling at her, he added, "I am pretty sure you knew my mom, since she spoke of you before we parted ways." Once the alpha had said his part, the two quickly left camp. They were acutely aware of where everything was already. Their genetic link with Craven privileged them to this information. Without hesitating to explore or look around, they went straight to the hot springs. Their bodies ached from the journey. Later, they would have to find the huntress and have her lead them around, but for the moment, they were happy to just relax. Now free of helping her pack, Zivota let herself go. The spaztic, excited fae bolted forward eagerly as she chased after Orla and Craven's scent. As she came upon them, she ignored both brutes, pushing between them as she dipped her head to the new fae. Wagging and smiling, the beautiful, oddly colored fae whined an excited, "Hello! I am Zivota. Welcome to Suplji Plakati!" Pushing forward bravely, she brushed her muzzle lightly against Bella's in a social greeting that was neither formal nor friendly. Her whole body wiggled as she told the other, "You are the first fae I have seen in moons. I pray that you will make here your home." It appeared, for a second, that a ghost of a smile appeared on Orla's face. However, as soon as he heard Craven's next words, it vanished as sure as if it had never been. His eyes returned to Bella with weary anticipation, but he slowly relaxed as he heard the other's explanation. Taking a pointed step back, he warned Craven softly, "We are family. If you are guarding her, you better make certain that she is worth it." His tone was cryptic in meaning and his dark eyes were impossible to read. There was a challenger and a hopeless light. It was odd how little joy he got from seeing his friend. He could remember. As it became more clear that Bella didn't know Craven, he sighed a breath of relief, only to tense again as he heard his half sister approaching. Making no attempt to hide his disdain, he nipped her harshly on the flank, scolding her boldness. Rather than apologize for his sister's behavior, he stalked away angrily. Bella's golden eyes suddenly flared with realization. "Craven!" She screeched, almost happily. It was insane, but it was someone who was familiar to her. She hadn't seen anyone familiar in a long time. Her vision was zeroed in on him, before she noticed Zivota. "Oh, hi." She smiled slightly, dipping her head in return. "I'm Bella, it's a pleasure to meet you." She paused, before adding. "I was going to try to, if that's, um- okay?" She asked, not sure if the female was Alpha or had power. Zivota's ears went back and she took two quick steps away from Bella as she dropped her head in apology. The young fae went from friend and energetic to reserved and brow beat. A forlorn glance at Craven made it appear as though she wanted to hide behind him suddenly. Whether it was the silence scolding or because the nip had subdued her energy enough to bring out the true her, it was hard to tell, but seemed to shrink, and she had been small enough to start with. Grinning, the brute dipped his head in acknowledgement. Baring his teeth at Orla, he clicked them together warningly as he watched the other stalk off. Smiling, he told Bella, "You will have to go with Zivota to see our leader, but if Ziv says yes, it is pretty well promised." Glancing at Zivota, he yipped and nuzzled her before leaping over her. On the other side, he dropped into a play bow and barked at her encouragingly before taking off running. With no reason in his mind, he chased after Orla. Zivota nearly froze in panic when the two brutes left her with a stranger. Her ears were pinned against her head submissively as she turned away from Bella and offered meekly, "I'll show you to Strava." Quickly, she started bounding towards the pack. Any time Bella fell behind, she circled back. Her body language was constantly frightened by friendly. It was obvious that she rarely met new wolves. Hearing the pursuit, he growled, though he had the twisted urge to laugh. Rather than demand what the other was doing, Orla took off at a run. Maybe, he could out run Craven and not have to deal with the idiot. That would be a nice change from the usual pleading, bugging, and bugging. All Craven wanted to do was talk and talk and talk. It killed the warrior. He wanted to practice, to strengthen himself. How could Craven not understand that? Hadn't he once been a warrior? Orla knew, whatever Craven claimed, there was a killer inside him. Orla wanted to know that strength. Bella nodded. "Okay" She said, sounding relieved. She wanted to comfort Zivota but knew it would take time. Slowly following behind, she stayed her distance, not wanting to seem like a threat. Seeing his quarry speed up, Craven couldn't help but break into a run so that he wouldn't fall behind. Whether he liked it or hated it, he had a prey drive and seeing the other flee fed it. Running swiftly, he grew closer to the fleeing heels. Wagging, he barked loudly, "Are you running or running from me?" Catching a familiar smell, the red brute felt his breath hitch before a growl rumbled in his throat softly. Shaking his head, he cleared it of the water and the scent. Looking around, he saw nothing and told himself it was imaginary. Moving closer to Ren, he nuzzled close to him and whined softly, demanding attention. In the moons that they had been isolated, they had gotten more pup like with each other. Whining, nipping, and pathetically pleading: it was just like it had been before either of them had known her. Laughing at his brother, he noticing nothing. He was too happy, to relaxed to worry about the past or the present. All he was focused on was the pool that they were in and it was empty except for them so he didn't mind too much. Just as they reached the pack camp, Zivota froze. Looking around frantically, she warned Bella quickly, "Mala snapped after Lost died, so he is really bad. Still bloody awesome healer, but can't think straight. Don't frig with him or he will make a scene. Strava is our alpha, and he is protective of all of us, so upsetting Mala would be bad. Back there was Mala's twin, Orla. Strava is really nice but he tends to be a bit of a-" She cut herself off and spun around. Wagging and whining, she bound towards the approaching brute and yipped like a pup as she tackled him. "I am a what?" Strava asked Zivota solemnly. Knowing that she would never reply in front of him, the old brute switched his gaze from her to the new wolf. Taller than even Craven, his pure dire roots showed in his height that was nearly five feet at the shoulder. With his head held high with pride, he could be a frightening sight. However, his calm, powerful energy was oddly soothing. Barely inclining his head in greeting, he told her in a steady, deep voice, "I am Strava, alpha of this pack. I have heard you are called Bella. Do you bring talents?" Bella quickly took in what she was saying, before the brute approached. She looked weary at first, but soon stood her ground, though her position was respectful, as her head lowered. "Yes. I do have fighting talents, but I'm not sure if they could be use to you. Otherwise, there is hunting." She nodded, hoping it didn't sound too strange. She was a bit tense, and it made her babble alot. "Does that even make sense to you!?" Orla demanded in a dark snarl. His mind was already far away...so he told himself. Honestly, running wasn't enough make his heart race, but he didn't want to acknowledge the only fact that was in his face. Shaking his head roughly, he attempted to think of something else. Poor Mala had been alone all day. His brother was probably frantic. No, his brother was stronger than that, stronger than him. Maybe he should go apologize to Zivota. No, she was dealing with the stranger that knew Craven before Orla did...Wait, why did that matter to him? Angrily, he told himself it didn't but it did. It really did and he hated it. He didn't want to be jealous of the friends of his only friend. Yet, he couldn't help it. Craven was the first stranger he met. That was why he was possessive.